← To know or not to know? What are the Alzheimers Core Conditions? I realised that, in order for Mum to have the best experience possible at this time, certain core conditions needed to be satisfied. Mum is in the care home now and to my surprise she is settled and fitting in well to her new environment. My relationship with her has changed too. Instead of me tearing my hair out trying to reason with her when she no longer understands reason, as I did in the past, Mum and I are finding a new way of being together. I have become her companion and it is lovely. It was only when Mum was being cared for in the care home, she and I were able to relate to each other in a more reasonable way. So don’t feel you have let your loved one down by deciding on this path of care. It goes without saying that Mum, and everyone at this stage, needs to have a sense of wellbeing, and I want her to experience this in body, mind and spirit. The staff love Mum and she knows this and reciprocates their love. They are also very efficient and competent. The home is warm and comfortable. Being right next door I can pop in frequently and we talk together. On a nice day I take her out for a walk along the promenade and bring her round to the garden of our house to have tea with us. All these things are contributing to her sense of wellbeing, something she hasn’t experienced for years, if ever before. I am asleep in my London flat when I am suddenly awakened by the sound of my phone ringing. It is the night sister at the care home. She tells me that they have found Mum deeply unconscious and can’t get any response from her. They are waiting for a doctor to arrive and will phone me as soon as they have any news. Naturally I am deeply shocked and, fearing the worst, start to pack my bags in preparation for catching the first flight in the morning. An hour later my phone rings again, and with my heart beating loudly, the visiting doctor tells me that Mum has come round and, much to everyone’s amazement, seems none the worse of her near to death experience. She explained that Mum had probably suffered a transient ischaemic attack (TIA), a mini-stroke, common in people of her age, and that more could follow. This near to death experience that Mum had has been a wake up call for me and alerted me to the need to be more attentive. As the months pass Mum is becoming more and more frail and as I witness this, feelings of compassion arise in me. This is a new feeling as so much of our lives together had been challenging. But I yield to this softening towards her and start to go with the flow. What are you seeing? What are you feeling? If you stop and feel you too might feel the kind of compassion I felt. Mum notices the change in me and she in turn becomes more loving towards me, saying things she has never said before. Soon a beautiful symbiotic relationship develops between us that is deeply healing and nourishing and continues. People with Alzheimer’s naturally want to love and be loved, as do we all. 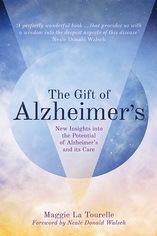 Alzheimer’s offers us a wonderful opportunity to experience and share this.